TAAI CONVENTION – A reverberating success. Hon’ble Chief Minister acknowledges TAAI for the handholding. The 3 day most historic TAAI Convention, an eagerly awaited event of the Travel & Tourism industry of India, resulted in resounding success. The 64th Convention and Exhibition of TAAI was organized at the most prestigious and mesmerizing city, Srinagar, “the crown jewel” of Kashmir valley situated on the banks of Jhelum River flanked by the snow-clad mountains from 27th to 29th March, 2018. The convention was ably supported by Ministry of Tourism, Jammu & Kashmir. The event received excellent cooperation and support from the Convention Hotels; Hotel Associations; House Boat Owners Association and other travel and tourism associations of J&K. TAAI J&K Chapter played the role of coordinating committee for the convention and delivered a great event. The Convention was inaugurated by Her Excellency, Madam Mehbooba Mufti, Chief Minister, Jammu and Kashmir. She acknowledged TAAI for the hand-holding extended as she delivered a touching address to the delegates and compared Kashmir with “Jannat”. Minister for Tourism, J&K, Mr Tassaduq Hussain Mufti who addressed the convention, was present along with six other ministers of J&K. State Minister for Tourism, Ms Preeti Seth also addressed the audience. In the words of TAAI President, Sunil Kumar, it offered to Jammu & Kashmir – Visibility; Connect and Opportunity. The manner in which the event was covered by the Media and the industry partners through digital and social media connect, brought in extensive visibility that Kashmir is a safe place for tourists and such large MICE events can be held here. It offered J&K with a huge connect – with the industry; with the Media and with the world in general. It is now an opportunity before J&K to optimize the TAAI presence in Kashmir where the TAAI convention was held most successfully with over 650 delegates participation from across India and some countries of the world. Over 45 media leaders travelled with TAAI to Srinagar to cover the event and they were inspired by the hi-quality convention that TAAI presented. The Convention brought to the forefront the most outstanding beauty of Kashmir; its serenity; awesome scenic wonder and the warmth expressed by the local citizens who were absolutely courteous to offer the delegates a life-time experience. The TAAI Convention at Kashmir had these hi-lights that added greater value to the Convention. TAAI committee which arrived on 25th March joined the opening of Tulip Garden at Srinagar and this added great fervor to the convention. On 29th March, 2018; the delegates were offered the visit to this stunning garden which was followed by Lunch in the adjoining and most lush-green botanical gardens. The TAAI GOLF TOURNAMENT saw its tee-off on the 27th March 2018 to commemorate the 64th Convention & Exhibition of TAAI. This was held in one of the most unique and stylish golf courses of the world – The Royal Springs Golf Course. Two teams – TAAI Tourism Team and J&K Tourism Team participated with over 35 golfers celebrating the game in this most astounding golf course. Mr Tassaduq Hussain Mufti, Minister for Tourism, inaugurated the TAAI Golf Tournament. 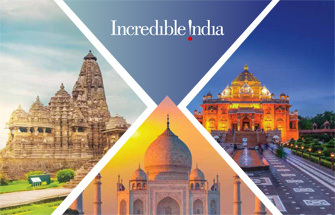 An impressive India Travel Trade Expo was held in the most popular SKICC – the Sher-i-Kashmir International Conference Centre, Srinagar boasts of. There was an overwhelming industry response. The large delegation of TAAI was well received and TAAI’s unmatched planning and hospitality made the delegates visit to convention most memorable. The Delegates were offered complimentary accommodation on the 26th and 30th March 2018 to experience the luxury of House Boats on Dal and Nigeen Lakes. The Delegates were also offered 2 nights pre & post tours to Pahalgam and Gulmarg, the two most popular hill stations located close to Srinagar. Thanks to IndiGo Airlines; the main partner airline of TAAI for this Convention, delegates who came from all over India were rewarded with one of the best domestic fares ever offered by IndiGo to Srinagar. The Knowledge sessions organized by TAAI on the Convention Theme ‘Incredible Tourism – Integration; Inspiration and Innovation” on the 28th & 29th March at the SKICC Auditorium featured subjects of great relevance. The event witnessed great Gala’s packed with some superb entertainment at the most profound locations of Srinagar. The Welcome Dinner and Gala of the 27th March was at the iconic and majestic Lalit Grand Palace; the Theme Dinner of 28th was on the SKICC Lawns overlooking the dazzling Dal Lake sheltered by the snowy mountains; and the Farewell Gala was held in SKICC Auditorium followed by entertainment and Dinner at the SKICC Lawns. This most splendid and fabulous event that was punctuated with uniqueness; wonder and absolute luxury will be ever remembered by those delegates who were gifted with one of the most valuable of tourism experiences; and by those in J&K who will remain grateful to TAAI for this prodigious gesture and valuable support to J&K and its tourism. It is predicted that TAAI convention will herald a large number of visitors celebrate their holiday; conferencing and events in this startling and amazing valley of India.